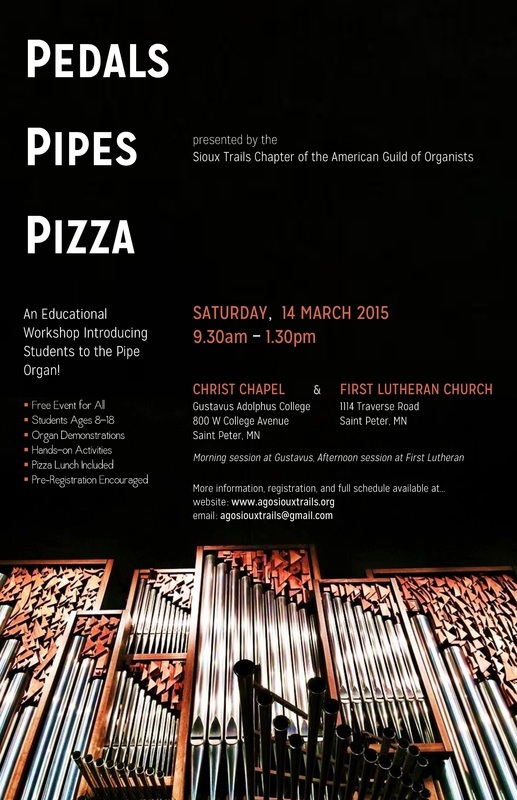 On Saturday, March 14, 9:30 am to 1:30 pm, the STAGO will host a Pedals, Pipes, and Pizza for area musicians ages 8–18. This event begins at Christ Chapel on the campus of Gustavus Adolphus College (800 W College Ave) and ending at First Lutheran Church (1114 Traverse Road) in Saint Peter. Activities will feature performances, hands-on trials, demonstrations of mechanics, videos, and more! Pizza and conversations with real live organists will end the day. Come for as much of the event as you can. Registration also available morning of event-simply show up!